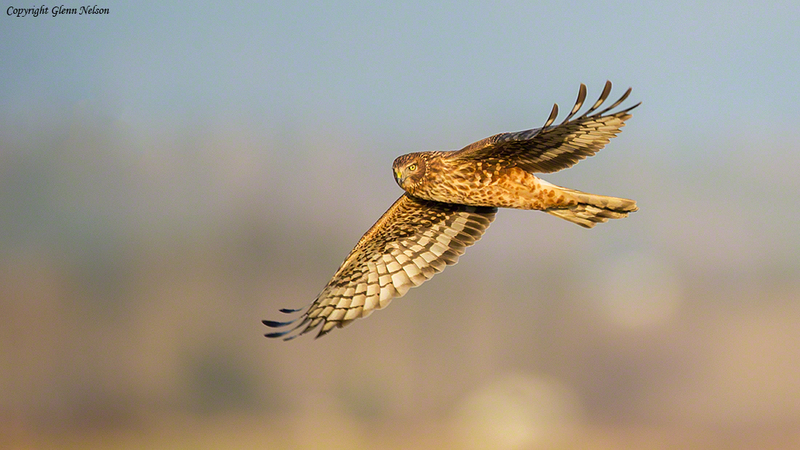 I couldn’t find Short Eared Owls, but I found a Northern Harrier and great light. A few weeks back, I was the first non-employee to arrive at what I’ve come to consider my “home” fields – Nisqually National Wildlife Refuge, south of Seattle near Nisqually, Wash. The sun was beginning to paint pink and orange rays against a darkened sky. Formations of Canada Geese were lifting off from the meadows, honking noisily. And where was this fledgling wildlife photographer? In the parking lot, struggling with a locked-up ballhead. You will find the solution to many problems on YouTube. You need to trust your equipment. I was so paranoid about supporting a giant, expensive lens, I kept locking everything down until it all became locked up. (Note: Clicking on images will launch a larger version in a separate browser window). I’d already learned one of the paramount lessons of photography: the world contains so many thousands of variables, you must be resilient, then you must be prepared for the next opportunity. Instead of “wasting” time photographing flocks of geese, I immediately searched out the Great Horned Owls and Owlets. Another photographer and I were the first to find them that morning. But (and didn’t you know one of these was coming), I intentionally left my teleconverter at home, seeking to practice getting closer to my subjects. That doesn’t help, however, when your subject matter is way up in a tree, back in an area that is off limits. 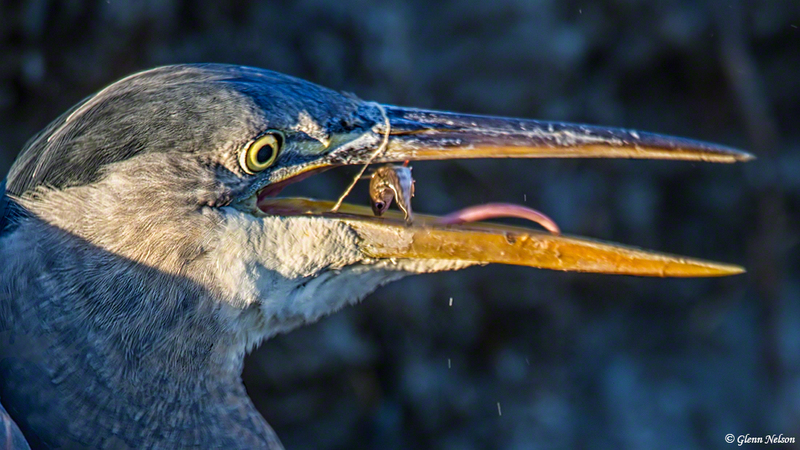 Like a lot of pursuits, nature photography – heck, photography in general – is a humbling experience. I’m a writer, after all, who sometimes forgets to arm myself with a writing instrument. Imagine all the gear and settings I forget with regard to photography, something that is more of an emerging, second arena for me. 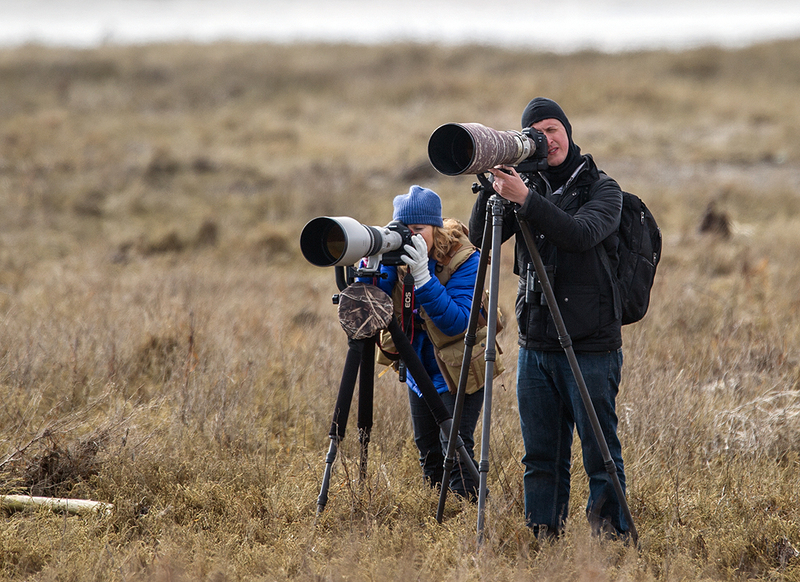 Properly geared bird photographers at Boundary Bay. The weight of it all: The thing about photographing nature is that you are on the move, mostly over uneven terrain. You’re not pulling your gear in a rolling Think Tank case, like I used to do when I was shooting sports. You’re sludging around in a marsh, either observing or on the lookout for subject matter, with your gear slung over your shoulder. It adds up – 11 pounds alone for a 600mm f4 lens, plus a camera body, tripod, gimbal head, leveling platform. For me, it’s about 22 pounds. At the gym, I can lift 22 pounds like it was nothing. But 2-5 miles out into the field? Let’s just say the first time out, I came back with sore and marked up shoulders and collar bone. No one told me how much carbon fiber tripod legs can hurt. I thought I was a genius for conceiving the need for tripod padding. Turns out, everyone sells them, even in camouflage print, so you don’t stand out so much while lining up for a prized shot of some rare bird. Specialty equipment: Speaking of a gimbal head, know what those are? The first time I went out with a group of wildlife photographers, I had no idea. Most of them had one – a special head, mounted to tripods, that balances those big lenses and makes it easier to pan and tilt. And here’s me with my gear on a monopod. Oh yeah, a tripod. People usually associate them with, what, graduation portraits, maybe, and time-lapse photos. The big lenses are too cumbersome to hand hold and, at those focal lengths, every tiny movement is amplified. For nature photography, a tripod is a must; so is a gimbal head. Who knew? I do now. Oh yeah – this is not exactly specialty, but don’t forget some water, maybe a bite to eat, a blower and polishing cloth to get the dust off your lens. I also carry my cell phone, just in case I step in quick sand. It’s out there. Other essentials: No one tells you this, either – if you are going to a favorite birding area like, say, West 90 in the Samish Flats, that land is managed by Washington State Fish and Wildlife, meaning you need a Discover Pass hanging from your rear-view mirror if you’re going to park in the nearby lot. An annual pass is $35. If you’re spending a lot of time in National Wildlife Refuges (like Nisqually), you might get a Duck Stamp for $15 that allows entrance to all NWRs, or an annual pass to a specific NWR. An Interagency Pass, also permitting entrance to national parks and other federally managed recreation lands, also works and costs $80 per year. Either that, or pay an entrance fee for every visit. Ready for the weather? Maybe not — see story. Weather-proofing: You’d think this would be a no-brainer for a Pacific Northwest native. And, for the most part, it was for me. 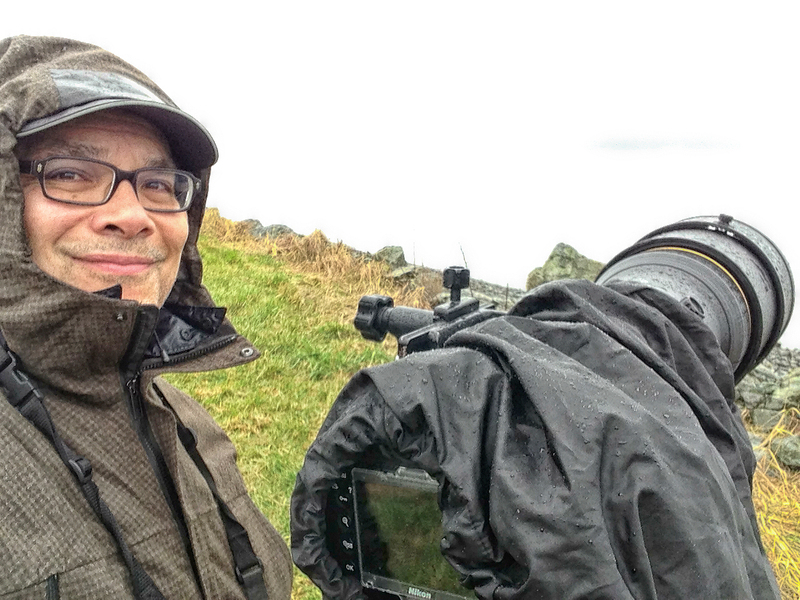 I have a rain jacket, rain-proof cap, waterproof boots and even a protective sleeve for my lens and camera body. I also thought I had water resistant hiking pants – until three miles after stalking a family of Bald Eagles, I looked down and saw my pants were soaked through. This was not a very auspicious start to an overnight trip to Canada and back. Now I’ve got some Gortex pullovers. During the winter, you’ll need windproofing in addition to waterproofing in your outer shell. If you’re after wildlife, you’ll likely be near a water source and most have bone-chilling winds blowing off them. Another thing to think about with regard to your outfit: Unlike at the club, you don’t want to stand out. The birds aren’t looking for a human dance partner. They aren’t looking for humans – period. Another thing: you don’t want your clothes to be loud. Seriously. No cords out in the field. Cooperation: Information is the currency among birders. There are a million possibilities, and huge ranges, that no person on her or his own can possibly find any given creature. So prepare to ask and be asked. In my experience, birders have been among the nicest people I’ve ever met. Maybe the essential nature of the data exchange is a major reason. For the most part, I’ve also found that people who have important information are eager to share it. In turn, I’ve tried to be patient in describing where to find sought-after sightings. Since I’ve started toting camera gear to my birding excursions, I’ve learned there are some tensions between birders and those who seek to photograph them. Photographers tend to be a little noisier and always want or need to get closer to their quarry. Some birders can get sanctimonious over this. Everyone’s right – we need to coexist. Another thing I’ve learned on the trail –toting impressive looking gear, whether it be a big lens or a nice spotting scope, seems to connote authority, so a lot of people will assume you know where to find the goodies. And hopefully you will. Be prepared for failure: Once you start getting the hang of this, you are going to stop settling for, say, the chickadee on a branch. You might go out in search of a specific photo or subject matter. And you might get shut out. 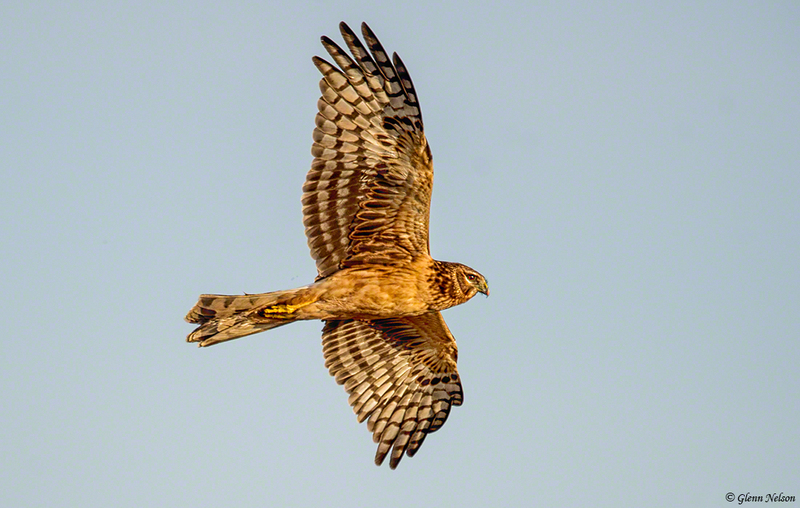 I recently spent an entire weekend looking for Short Eared Owls. I saw one, but it was too far away and flying away from me. So I didn’t get any Short Eared Owl pictures, even though I spent hours at four different places and went all the way up to Canada. But I learned some things. For one, the search would have been more fruitful during the dead of winter, when prey was more bountiful, the hunger more pronounced and the migration period wasn’t about to end. But I adjusted. I took pictures anyway, to practice. And (see below) I got some decent ones. Even if I hadn’t, the time I spent outdoors was soul slaking, well worth the time and effort. These are just a handful of easily overlookable facts of wildlife-photography life. The experts certainly will tell you to know your subject, and to be observant and patient. You might want to continue to run and gun, trying to capture a tiny bird as it flushes out of the brush, but those experts are right. After hours of watching, I figured out a “tell” for snowy owls as they were about to take off. I waited nearly three hours for what I consider my best bird picture to happen. After seeing the result, I can hardly remember if the wait was very difficult. Last moments of a fish’s life in the mouth of a Great Blue Heron near Fir Island, Wash.
Northern Harrier at dusk, near the Samish Flats at West 90. 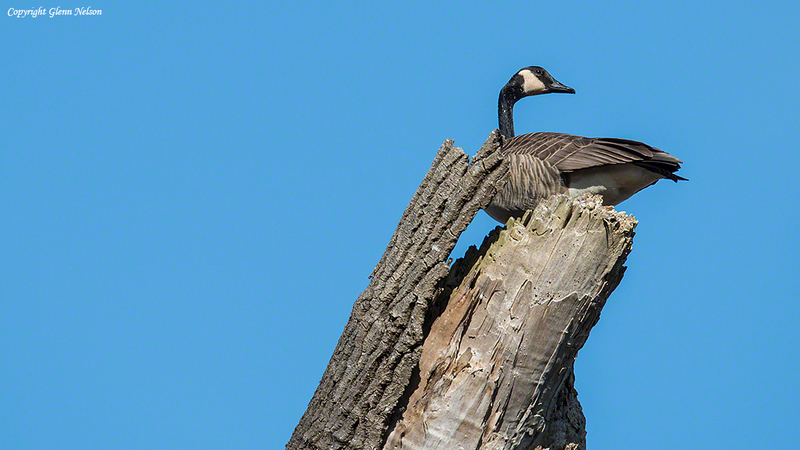 Canada Goose up in a tree at Nisqually National Wildlife Refuge. 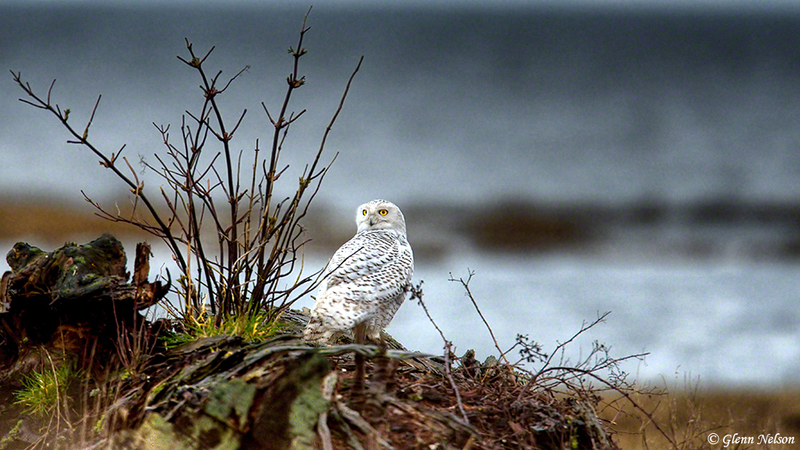 An HDR capture of a Snowy Owl at Boundary Bay, B.C.